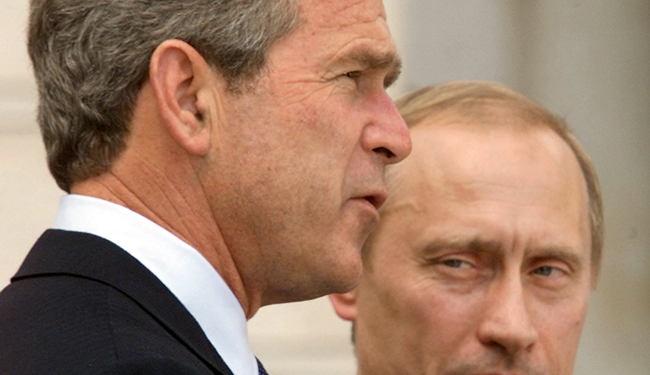 Russian President Vladimir Putin's op-ed in The New York Times yesterday came courtesy of U.S. PR firm Ketchum--the same company the Bush administration used in what the Government Accountability Office later called "covert propaganda." The Obama administration has used it, too. With his op-ed in The New York Times Thursday morning, Russian President Vladimir Putin has done what no American can--unite Congress. Granted, it's united by an intense, "vomit"-inducing revolution at the spectacle of being lectured to by a hostile strongman in the nation's paper of record, but at least Putin can claim an unlikely bedfellow in President George W. Bush. But it was the fake news broadcasts that Ketchum produced on behalf of HHS that really ran afoul of the law, according to two opinions released by lawyers at the GAO. The health department's "video news releases," which ran on local TV news stations, violated a prohibition on government propaganda as well as legal appropriations limits. "HHS's misuse of appropriated funds in violation of the publicity or propaganda prohibition also constitutes a violation of the Antideficiency Act," GAO general counsel Anthony Gamboawrote in 2004. Since then, Ketchum has been busy working for the Russian government, securing op-eds in CNBC and TheHuffington Post, along with The Times, and making contact with editors on the government's behalf. That is, when it's not offending food bloggers.